Give every aspiring camper a chance to change their lives this summer. With JotForm’s Summer Camp Fee Waiver PDF Template, children and teenagers in need of financial assistance can apply for a registration fee waiver so they can participate in your summer program without having to worry about costs. 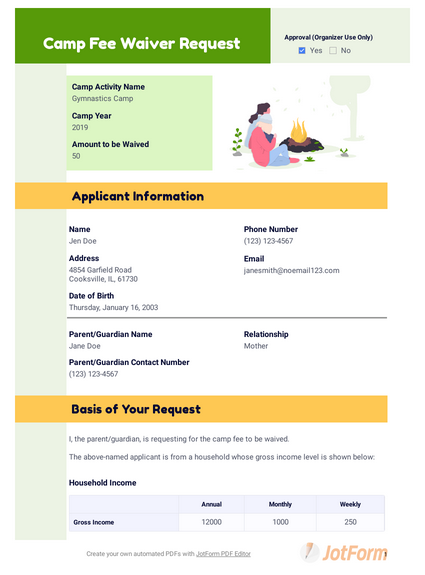 This Summer Camp Fee Waiver PDF Template allows applicants to describe the basis of their waiver request through household income only, but you can modify the template to include more information fields with JotForm’s PDF Editor. Your customized fee waiver form will instantly save all requests as PDFs that are easy to access, download, and print. By making the registration process easier for campers in need of financial support, you can provide everyone with a summer experience that’s priceless. I, the parent/guardian, is requesting for the camp fee to be waived. By signing this request form, parent and applicant confirm that the camp fee will be waived.